HON. SALMON A. PHELPS, Judge of Bond County, and one of its honored and prominent residents, now residing in Greenville, is a native of the Empire State. He was born in Otsego County, June 2, 1817, and is a son of Joshua and Elizabeth (Peck) Phelps, who were natives of Connecticut. His father removed to New York about 1800, locating in Otsego County, where he engaged in farming, about nine miles from Cooperstown. 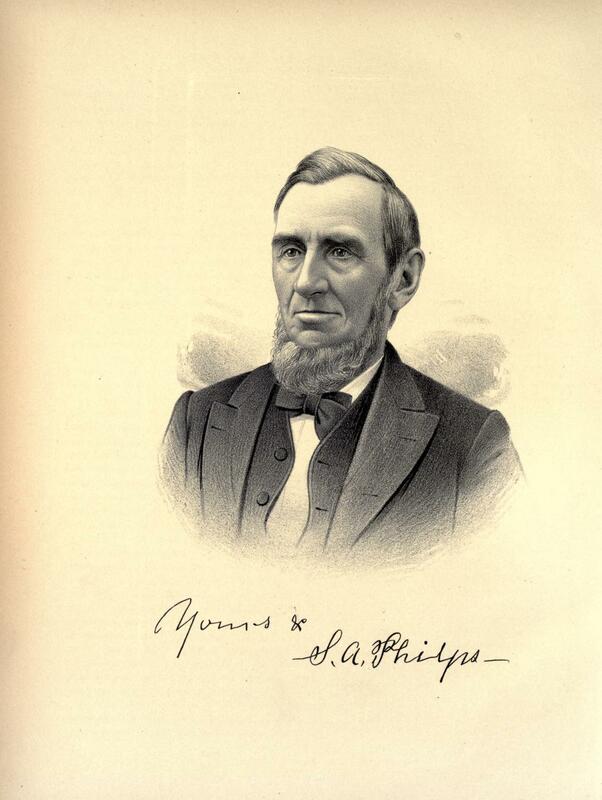 The Phelps family is of English descent, but was founded in America at an early day. 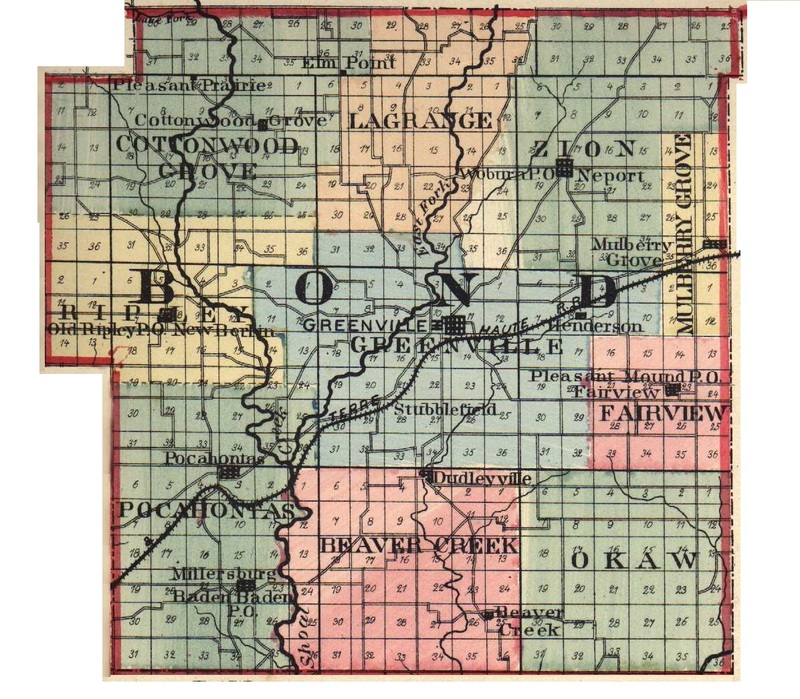 In 1848, Joshua Phelps emigrated to Illinois and resided in Bond County until his death. The mother died in Otsego County, N. Y., in 1819. They had a family of nine children, but only two are now living, Sarah and our subject. Salmon A. Phelps resided on the home farm in his native State until ten years of age, when he removed with his father to the village of Cooperstown, where his school life commenced. He there remained for four years, after which he became a student in the academy at Bloomfield, N. J.. and in 1834 entered Union College at Schenectady, N. Y, from which he was graduated in 1838. He carried off the honors, being valedictorian of his class, which enrolled ninety-five students. This college was then under the leadership of Dr. Knox. After completing his school life, Mr. Phelps engaged in teaching in a private academy in Steubenville, Ohio. Ere leaving New York, in fact when but a boy, he rode on the old Vanderbilt Railroad from Schenectady to Albany, the first road built in that part of the State. On leaving Ohio, he became Professor in a private academy at Woodville, Miss., for a year. While attending school and while teaching, he devoted his leisure hours to the study of law, and during his residence at Woodville he was admitted to the Bar, in 1841, and continued to practice in that place for several years. Judge Phelps was married in 1841, to Miss Hannah H. Bulkley, of New York, who died in 1843, leaving one son, Alfred C., who enlisted during the late war as a private in the One Hundred and Thirtieth Illinois Infantry. After a year's service, he was transferred to another company and made First Lieutenant. He is now an attorney-at-law of Denver, Colo. The Judge was again married, in 1845, his second union being with Miss Caroline Bulkley, a sister of his first wife. Unto them were born four children, one of whom is now deceased, and the mother died in 1881. George B., the eldest child, was a soldier in 1864, and is a prominent lawyer of Leadville, Colo., and has been County Judge of Lake County, Colo., for a term of four years. Rev. Philo F. is a Presbyterian minister, now of Fresno, Cal., and Charles B. is engaged in farming among the mountains of Tennessee. It was in 1844 that Mr. Phelps came to Bond County, but he did not permanently locate here until the summer of the following year. He is the oldest legal practitioner in the village. On coming to this county, he purchased land in Pocahontas Precinct, and has always owned land in the county. It was not long before he established a high reputation as a lawyer, and since that time he has ranked as one of the leading lawyers of the Bond County Bar. During his early residence here, he served for twelve years as Justice of the Peace, and was attorney for the Vandalia Railroad Company. In 1890, he was elected County Judge, and by his able administration of affairs has won the commendations of all. His rulings are just and show careful study and thoroughly-weighed evidence. In politics, he is a stalwart Republican, and probably no citizen has done more for the county than he. During the Rebellion, he was a stanch friend to the Union, and did much toward raising troops and fitting them for service. His life has been ruled by upright and honorable principles. Everywhere he goes he makes friends, and he is respected and loved by all who know him. Extracted 04 Dec 2016 by Norma Hass from 1892 Portrait and Biographical Record of Montgomery and Bond Counties, Illinois, pages 166-168.